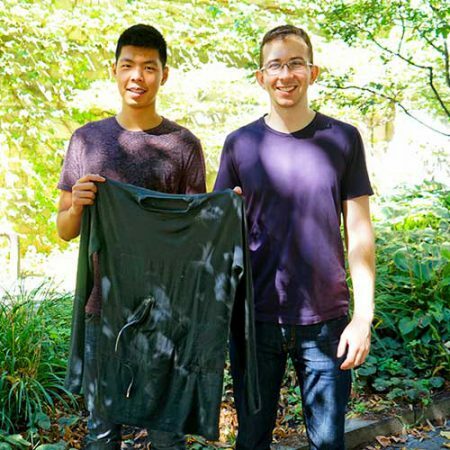 ECE graduates Alex Huang, left, and Jason Yakimovich of FuelWear show off the first Flame Base Layer. Were you a little chilly last winter? So were Alex Huang (ElecE 1T3+PEY) and Jason Yakimovich (CompE 1T3+PEY). Then fourth-year students slogging through bitter drifts to class, the two were so unimpressed by the “polar vortex” that they decided to take matters into their own hands by inventing the world’s first intelligent heated base layer. In just six months, the pair founded their company, FuelWear, and created a light-weight, washable and cozy undershirt they call the Flame Base Layer. The garment can add 10 degrees Celsius to your body temperature in -20 C weather for three continuous hours, and has a smart monitor that turns off when you’re warm enough, and on again when you cool down. Demand is already high. On August 26, FuelWear launched its first crowdsourcing campaign on Indiegogo with a target of $20,000. They reached it on September 2, just five days into their six-week window, and have been gaining momentum ever since. The shirt is made of premium bamboo fabric, chosen for its antimicrobial properties and washability. The heating elements are made of carbon fibre and controlled by specially designed printed circuit boards. Rechargeable batteries last for up to 12 hours of continuous outdoor use, and LEDs indicate battery life. The whole package weighs just a few hundred grams, which is slightly heavier than a modern smartphone. “It’s really soft—it feels great,” said Yakimovich. “We’re really happy with the way it’s turning out, and we can’t wait to start processing orders,” added Huang. But their journey hasn’t been all warm and fuzzy. 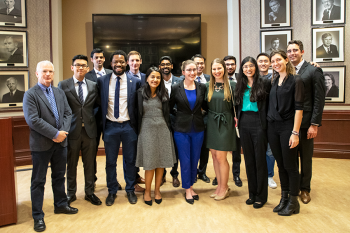 From early struggles with designing and testing the product, to identifying their target demographics, FuelWear benefitted from the help and guidance from U of T Engineering’s Entrepreneurship Hatchery mentors Professor Vaughn Betz (ECE) and Rotman graduate student Candice Luck. 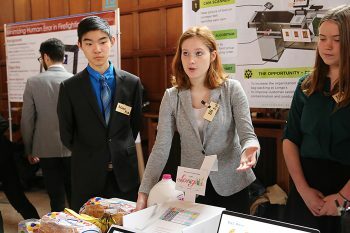 After being accepted into the Hatchery’s intensive summer program, Huang and Yakimovich met with Professor Betz to talk execution and marketing. Following market research, the duo began sourcing suppliers in June 2014. “We had to do a lot of testing to find the right materials to make it washable, because there are electrical elements in there,” said Yakimovich. Their first two attempts at a prototype were hand-sewed on a second-hand sewing machine bought for the project; neither claims to be a tailor, and the results were a little misshapen. By their third iteration, they had forged a partnership with established garment manufacturer Gruven Athletics, and supplied Gruven with a pattern. “Every time we made it, we made it simpler,” said Huang. 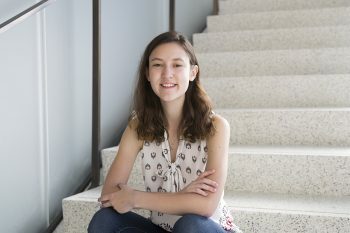 Huang moved to Edmonton from southern China at age 16, and met Yakimovich, who is also from Edmonton, during their first year of the Engineering Science program before both transferred into ECE. The two are now roommates in a condo at Bay and College, which makes planning business meetings simple. Having exceeded their funding goal, things are heating up for FuelWear—they hope to ship the first base layers in time for Christmas. For those Indiegogo investors who got in with FuelWear on the ground floor, it’s going to be a toasty winter. Find out more on their Indiegogo campaign.